Though the authorities have many sophisticated tools at their disposal  by 2014, it is projected that most of the border aboveground will be monitored by sensor-equipped towers  most tunnels are uncovered through human intelligence. There is, as yet, no easy way to detect the tunnels below ground. With swine flu frenzy gripping the U.S., the threat coming from south of the Mexico border may seem more real to many Americans than ever before. But the U.S. border authorities who patrol that 1,969 mile long border have another stealth threat to worry about. This month, they will begin installing the first small, 50 mile segment of a "virtual fence" on the dividing line with Mexico. By 2014 most of the border will be home to sensor-equipped towers that are linked to a central communications network. But while proponents argue that the system will help stem the flow of illegal immigrants, drugs and arms coming over the border, most experts admit it will do little to guard against people making their way under it. And as above ground border defenses and patrols get tougher, that subterranean vulnerability is becoming a growing problem. Since 2001, more than 100 tunnels have been discovered by U.S. law enforcement, compared with just 15 in the 1990s, and the pace is accelerating. Most of those have been uncovered through human intelligence, since there are no currently available technical means to reliably detect tunnels. The Department of Homeland Security started spending research money on detection technologies two years ago. But even the most promising ones  primarily adapted from mining and petroleum exploration industries  are several years from proving reliable. "We see this as one of those frontier threat areas that have to be mitigated but it is a very, very difficult problem area," says Rick Miller, a leading expert at the Kansas Geological Survey. Most of the tunnels are pretty crude, what law enforcement call gopher holes. Typically just a few feet down and only long enough to get under a fence or two, they can be dug with a pick axe and shovel in the span of just a few nights. Some of them tap into existing infrastructure, using paved roads as roofs, or by punching their way into extensive storm drainage systems that are sometimes shared by border towns, such as with the town of Nogales, Mexico and its northern neighbor in Arizona  also called Nogales. In some respects, though, it was predictable. Drug cartels certainly have the money to build these tunnels, and Mexico’s sizeable mining sector means there is plenty of tunnel engineering expertise available, willing or not. There have been at least nine very sophisticated tunnels discovered over the years, some equipped with rails to move contraband more efficiently. Authorities believe at least six cartels are thought to be capable of building major tunnels, and three have already undertaken them. "I would certainly think that [tunneling] would be the preferred way to go for drug smugglers," says Neil Anderson, Professor, Geological Engineering at Missouri University of Science and Technology Rolla, who has worked on the issue for the military. " 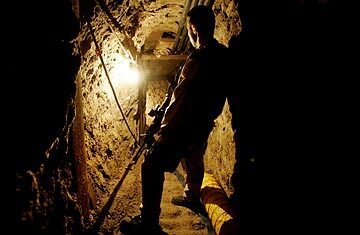 Still, even for cash flush traffickers, these narco-tunnels are not small undertakings. The Otay Mesa tunnel could easily have cost more than a million dollars; several hundred truckloads would have been needed to carry away the excavated soil. Covert tunneling entails more security risks that cost extra to conceal. On top of that, US officials believe they caught the latest sophisticated tunnel soon after it came online. "That's a huge hit," says Michael Unzueta, special agent in charge of Immigration and Customs Enforcement's Office of Investigations [in San Diego]. "Drug trafficking organizations don't want to lose money, narcotics, houses and the same goes for tunnels  and if they spent a year a digging a tunnel and then to loose that asset so quickly, that has to have some crippling setback effect." But for a business worth some $25 billion a year, that's debatable. "The cartels can afford to dig ten tunnels, have nine of them get discovered, one doesn't and the money they make off of that one tunnel pays for all ten, and then some, so why not," counters Austin Long, a security expert, and associate political scientist at the Rand Corporation, who points to all the other exotic and expensive ways cartels have devised to bring drugs into the US, including submarines and ultra-light aircraft. Read about The Great Wall of America. See pictures of Culiacan, the home of Mexico's drug-trafficking industry.